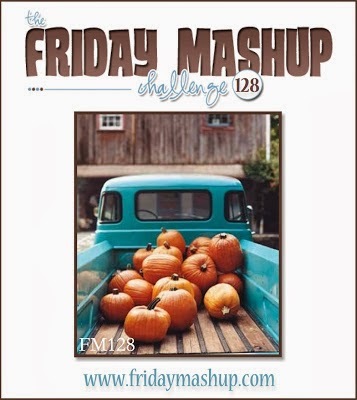 I'm bringing you this weeks challenge over at The Friday Mashup! It's that time of year to gather food and put it away for the winter. Here in Alaska I've been collecting low bush cranberries, yummy! Are you collecting anything from your neck of the woods? Canning, perhaps making jam? If not that's ok, just do it through paper! Let's see what you can create with a fall harvest theme....pumpkins, apples, berries, jars......anything that says fall harvest. Add some paper piecing to your project and you've got the Friday Mashup for this week! I used the set Perfectly Preserved, and for my paper piecing I pieced the cover of the jar. 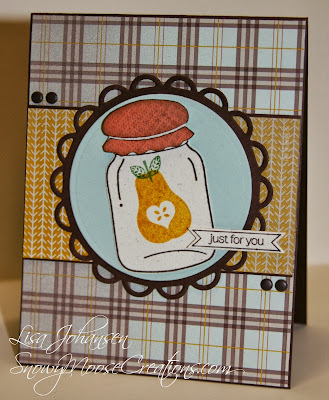 I initially stamped the cherries from the set in the jar, to make it look like the cranberries I'm picking but I didnt like how it looked so I changed my direction and put this pretty pear in the jar instead! Create a project with a "Fall/Harvest Food Theme (Preserves, Apples, Pumpkins etc.)." Create a project using "Paper Piecing." 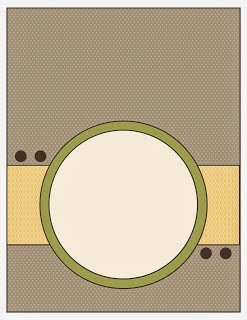 Or Mash it Up and create a "Fall Food themed project with some Paper Piecing "
I'm also playing along with the current challenge at Try Stampin' On Tuesday, thats where this great sketch came from! Lovely fall card Lisa - great choice of stamp set and papers! Fantastic card! Love your little jar on the blue background. Perfect for fall! Thanks for joining us at Try Stampin' on Tuesday. Hope to see you again soon! What a great card for fall, Lisa. Makes me think of all the pears I used to can (but don't anymore! lol). What a great card to give away with something special you've made for someone. Thanks for playing with us this week at Try Stampin' on Tuesday. Perfect challenge for the Perfectly Preserved set - very fun challenge! This came out great Lisa.. I love the colors of the DSP you used. Your challenge is perfect for this time of the year which is my favorite. I love your card!! Thanks for the fun challenge.